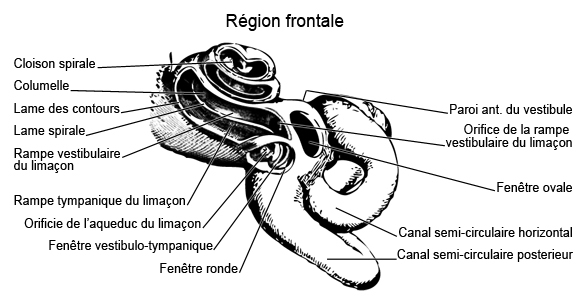 The cochlea or snail shell constitutes the anterior labyrinth. With two and half turns on its axis, it has the shape of a snail shell. 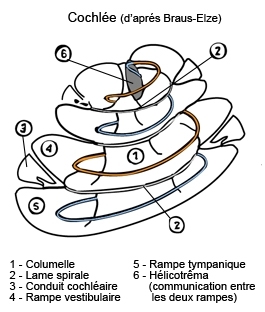 - the spiral lamina, the base of which supports the interior wall of the reticular lamina. The lower wall of the cochlear duct is formed by the basilar membrane that houses the sensory apparatus, the organ of Corti. The upper wall comprises a double epithelial layer, the Reissner’s membrane. Above the cochlear duct is the vestibular ramp, and beneath it, the tympanic ramp. The former interacts with the stapes and the second with the round window.